As the weather starts to warm up, there's simply no excuse for staying indoors. With lively music festivals, intimate gigs, live street art, and more there's plenty of things to do in Sydney this weekend. So get to it! If you're into brooding bass, epic guitar riffs and tricky tempo shifts then get down to the Bull N Bush Hotel in Baulkham Hills this Thursday to see The Owls. After releasing their third EP, "Own The Streets" in early July, the four-piece band is finally bringing their national tour to Sydney's doorstep. The best part? It's FREE entry! Find out more about The Owls here. Feeling those summer vibes already? Why not kick-start your weekend with a warehouse party featuring Seekae? The electro three-piece will be DJing a 3 hour set live while you enjoy some drinking, dancing and good conversation. Drinks will be sponsored by the Rocks Brewery Company and Naked Wines. While the free tickets have sold out, get yourself on the waitlist for your chance to party! Get on the waitlist now! Fancy a few casual post-work drinks? Well Italian beer enthusiasts, Peroni are launching their very own pop-up bar at ABODE Bistro this Thursday! Kicking off at 5pm, the launch will feature the divine sounds of Milan Ring and $6 Peroni beers all night. Can't make it this Thursday? Fret not, as the pop-up bar will be open for business every Thursday and Friday night until the 27th February, woohoo! For more information, head here. It's that time of the year again where parents are usually strapped for ideas on how to entertain their children. Yep, we're talking about school holidays. 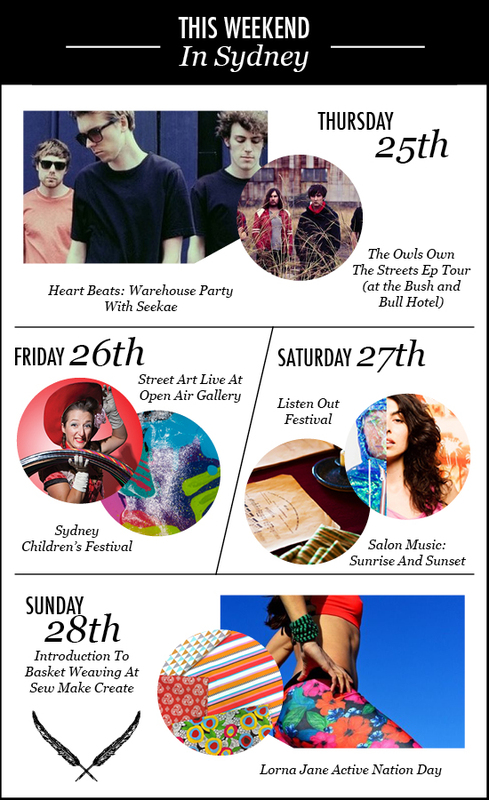 This weekend the Sydney Children's Festival have got you covered. From Thursday until Sunday Sydney's Seymour Centre will host an array of events to keep your little ones on their toes! Discos, various arts and crafts workshops, stage shows and more, the Sydney Children's Festival has got it all! For pricing information and detailed show times head to their website. Established as Australia's longest running open contemporary street art project, Project 5's "Volume 6" will be taking over the Darling Quarter this weekend. The event will bring together four of Australia and New Zealand's freshest talents to create epic street art, LIVE! The event is FREE and the live painting will be held from 6-9pm this Friday and 12-3pm on Saturday and Sunday. Find out more here. Flume, Chet Faker, Schoolboy Q, Ta-Ku, Zhu, Wordlife and more! Our ears are buzzing for this year's Listen Out Festival this Saturday at Centennial Park. Kicking off at 2pm the festival is bound to be an arvo filled with good tunes, tucker and drinks. It's also a good chance to welcome home our beloved Aussie sound professors, Flume and Chet Faker who have finally returned home from their international tours, and let us tell you their sets are a must see! Tickets are still on sale and can be purchased from the Listen Out website. If you're a bit of a classical music lover then this event is definitely for you! Enjoy works by Bach, Handel and Haydn performed by mezzo soprano Anna Yun as well as a string quartet from the Australian Opera and Ballet Orchestra in the stunning saloon of Elizabeth Bay House. The concert will run from 2:00-4:30pm and is sure to create a relaxing atmosphere on what we hope will be a sunny Saturday afternoon in Elizabeth Bay. For ticket information head here. Daisy's Milk Bar is back, and boy are we excited! Sydney's World Square will once again play host to Daisy's Milk Bar as part of the City of Sydney's Art and About program. The pop-up bar will boast all of your favourite frozen goodies including classic milkshakes, sundaes and spiders. Daisy's will also be serving up some delicious savory jaffles and hotdogs – yum! Open from 10am daily all weekend, head on down to World Square and treat yourself. Us Sydneysiders are a healthy bunch! For things to do in Sydney that are healthy this weekend, check out the Lorna Jane Active Nation Day. Grab your brightest activewear, pack a towel and head down to Bondi Pavilion and get ready to sweat-it-out with your sporty sisters. The 45min MOVE class will start at 8am sharp followed by the MNB market filled with hydration stalls serving up refreshing coconut water and yummy nut mylks, and even a DIY Beauty Bar. Sign us up! Read more about the event here. Feeling crafty this weekend? This Sunday, Sew Make Create will be hosting a basket weaving class! Starting at 11am you will experience 2x2 hour classes to learn the art of basket weaving. The classes will cover simple weaving techniques to create your own woven basket or vessel out of colourful recycled materials – how cool! They also run workshops for kids over the school holidays! For more information and to purchase tickets head to the Sew Make Create website.